Coffee, Hills, Foliage and Beaches – Part 2 - Ghumakkar - Inspiring travel experiences. 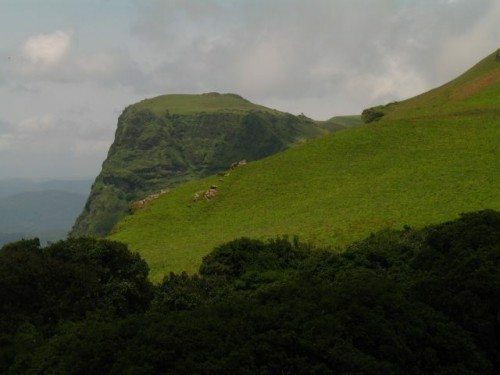 We had thought of trekking the highest peak in Karnataka called “Mulayangiri”. Even though there is a road which winds up and goes upto the peak but we wanted to trek. We drove upto a place called called “Sarpadari” from where the trek starts which is on the road to “Kemmangudi” a small hill station. 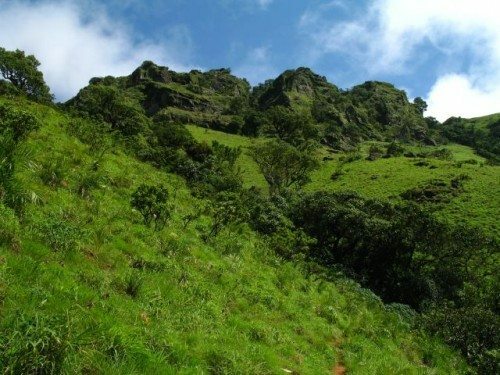 It is one of the well known trek in this region. 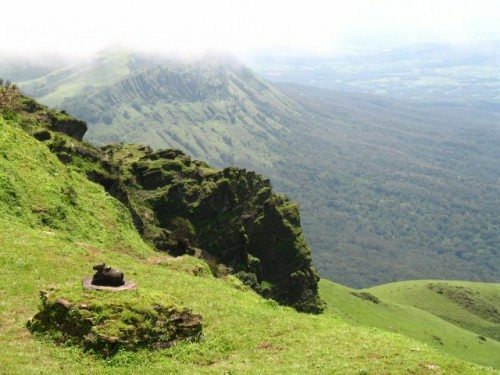 Other one is to go to Baba Budangiri peak via Galikere. Once we entered the gate through which trek starts, we were unaware of what lies ahead for us. Entry to the Mulayangiri trek, Sarpadari. With morning sun, mild breeze and oodles of spirit, the setting was perfect for trekking. The trail was clear most of the time but mountain slope was all covered with overgrown grass and different plants and shrubs and occassional trees. Climbing was a little tricky at some points due to wetness and there was possibility of slipping. The trail most of the time was steep and we were gaining height rapidly. We got worried, how will we come down with slippery surface? But that worry was for later as we enjoyed the mist covered mountain upwards and valley beneath. The peak has a Shiva temple. Interestingly, the “Nandi” statue is located a little away from the temple in open. I have seen such a practice for the first time. The view from peak were so stunning that for first 15 minutes we just sat silent admiring the views and only later thought of praying inside the temple. We were now looking for options to go back by hitch-hiking or simply walking on the road. But we met a local young man who made going back down look like a cake walk. We reluctantly agreed and started getting back the same way we came. It turned out to be easier but I slipped multiple times due to slippery surface to laughter of my buddies. 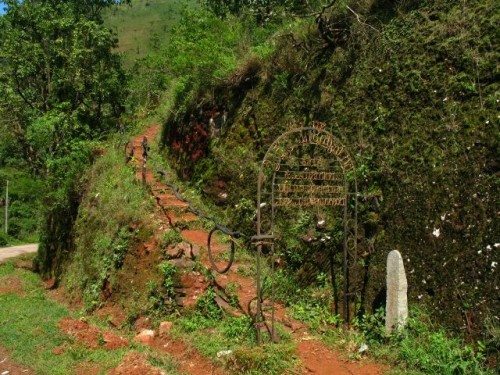 Once we came down, we headed for Kemmangudi, also known as KR Hills (Krishna Rajapuram Hills). The road was bad but it is okay considering its location. There was a waterfall in every cervice of the mountain slope. Sometimes we saw the white water and sometimes we only heard it. 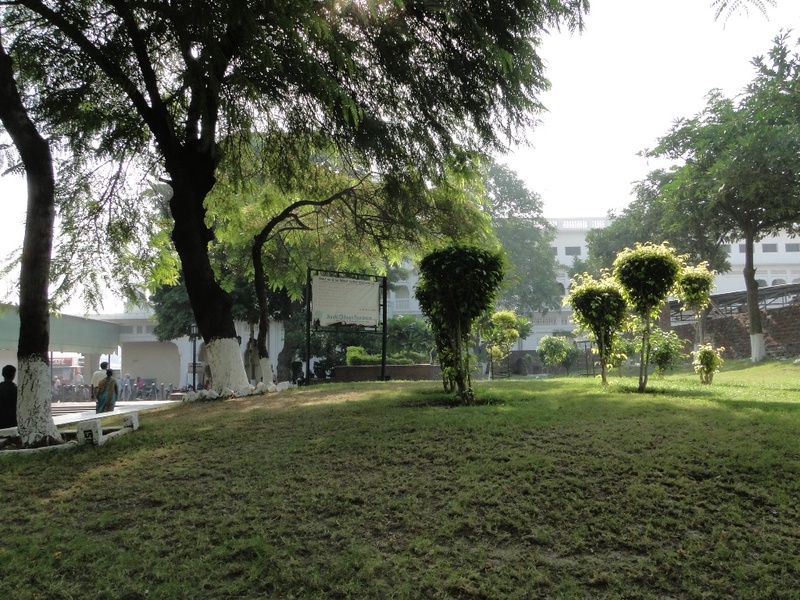 Soon we reached Kemmangudi which is protected area and is devloped with lawns, canteen and some other paraphernilia. “Hebbe” falls is one of the big waterfalls in this region. I had been to Chhattisgarh recently famous for its giant waterfalls, so I wasn’t so keen to watch it. But eventually we gave in to temptation. The falls are inside a private coffee estate and access is very difficult. One can go there in only a 4WD Mahindra jeep or similar such vehicle as there is not paved road. One has to descend a rocky mountain slope which modern cars cannot tackle. The first view of falls was unimpressive though it turned out to be only its first stage. From where jeeps cannot go further one has to walk down a little bit over rocky and slushy path along the river on which falls lie. One has to cross the river itself thrice which could be knee deep with stones at the bottom. Only once you curve into the valley where waterfall is, does one realize its enormity. The white water was gushing with so much force that water droplets were clouding the entire area, so even if you are away from the falls, you will get wet. There was a pool created beneath which was very deep and no one dared to venture inside. Most of the people who wanted to have a bath stayed at the periphery of pool using rocks as support. We also ventured like this and bruised ourselves while negotiating slippery rock surfaces and stones at bottom. Because of force of water, the wind was also blowing very fast. After being there in water for some time and competing among ourselves who can stay for more time inside water, we came out. In between I has a nasty slip when from standing upright, slipped and landed on my buttocks on a hard rock. Anyways I survived that. While on the ride back upto Kemmangudi, we befriended few locals who worked in the coffee estate and with broken hindi, english tried to converse which was very entertaining. I like such interactions. They were asking me to write a letter to tourism minister of state to build a road to this place which will end their woes. 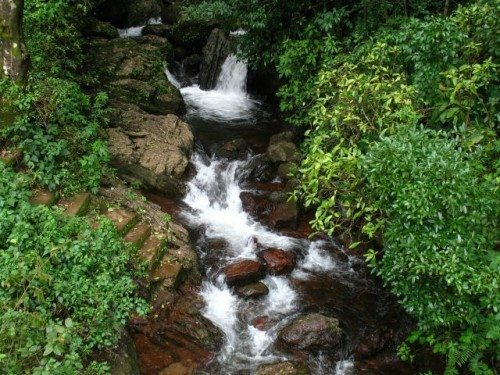 Once we were back to Kemmangudi, it was already dark and had to do away with plans to visit “Kallati” falls, another famed waterfall and drove back to Chikmaglur via “Kallatipura”. Driving in the night through winding roads is such a thrill. Anyways, a mountain trek and bathing in huge waterfall is enough entertainment for one day. Next day we started early and went to Dattapeetha on Baba Budangiri hill. There is a “Hindu-Muslim temple” as locals call the shrine dedicated to Baba Budangiri. Baba Budangiri is attributed to have brought coffee plant to India from Arab and there quite a few legends about him. 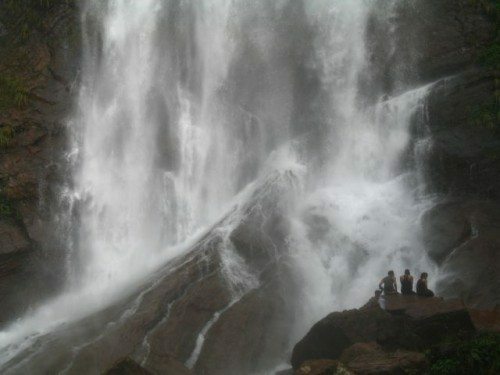 From here, one could climb the peak and road ends at “Manekydhara” waterfall. The waterfall is adjacent to a muslim shrine and it was developed with areas to bathe etc. It was not very inviting so we concentrated our attention to deep valley beneath and the surroundings. The valley was so very gorgeous with lot of greenery and houses in between, stretching endlessly, only haze terminating the view. There were couple of small ponds formed along side the road due to rains. 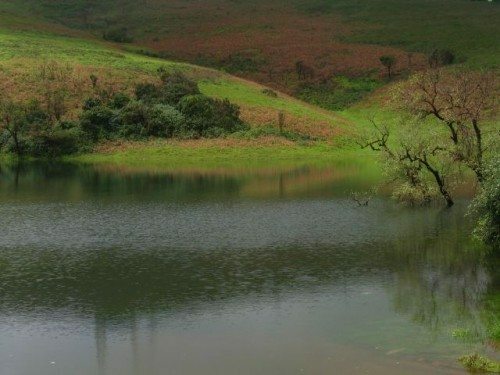 The water was still and green and with green meadow of mountain casting its shadow on the water, the scene looked straight out of some foreign locale. We kept on stopping at all such occassions for pictures. We were confused. How many should we click? Everywhere we look it was equally beautiful and we really missed having a better camera to do justice to this locale. We again came back to Chikmaglur town because road to Udupi was towards opposite direction. While going down the same path of CCD, we stopped for a while to visit CCD’s parent company. I was apprehensive that we would not be entertained but staff there was cordial. The receptionist guided us to Asstt. Manager who gave answers to our questions and served us a coffee brewed mechanically in one of CCD’s vending machine. The coffee harvest season is suppossed to be in Jan to April when green coffee berries which we saw in so much adundance turn red. 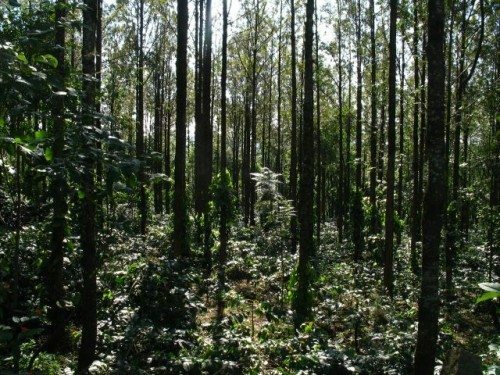 The coffee plants need to be protected from direct sunlight because of which lot of trees like Cardamom, pepper and Silver Oak are also planted along with them to give them shade. Coffee shrubs among other trees. I have been to Karnataka but only to the most frequented cities like Bangalore, Mysore, Ooty, Mangalore etc. Probably will plan another trip. Ohh lovely photos man. Really mesmerising. I agree with everyone else, the place looks mesmerizing. With its colors/shades/hues of green, red it do look like a dream like place. The best part is that the whole place looks wild. Waiting to read more from you Roopesh. I stayed in Kemmangundi forest guest house for 3 days and it was a memorable stay.There are plenty of trekking roads in this part.Your blog brought back memories of the wonderful time I had in September 2009.Once on the hilltop, there is a panoramic view as far as our eyes can see and on a clear day, it was breath taking. Karnatak and Kerala are the two states abundant with natural wooded areas and the people are also friendly to tourists. Completely agree that Karnataka and Kerala are two gifted states in India with abundant forests and natural beauty and are conducive to tourism. 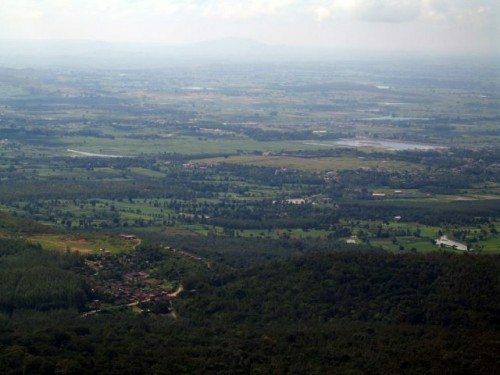 There are other forested states like Chhattisgarh but very conducive to tourism. An error. It was not a forest guest house. It was Horticulture guest house. It is also open to public.. Thanks Vibha for putting up the posts and everyone for kind comments. Wonderful landscapes. Karnataka is beautiful indeed! I am getting this recurrent feeling of taking a break from North, more so because I seem to have exhausted all the usual local joints. This log is very tempting, it reads like an old fiction, a place which doesn’t exist any more, you know that kind of feeling which you get when you read a really old travel book or even a recent one (say In Xanadu). Blr as a basecamp with a plush job sounds like a plan :-) I am likely to visit Blr next week and I guess I should try to look for options. घंटाघर के प्रवेश द्वार से पुनः अंदर कदम रखा तो सिक्ख संग्रहालय नज़र आया। सोचा कि चलो, इसे भी देख लिया जाये। हॉल में प्रवेश करते ही दाईं ओर ऊपर जाने के लिये सीढ़ियां थीं । ऊपर पहुंचा तो लिखा मिला, “फोटो खींचना मना है जी।“ पहले तो बड़े ध्यान से एक – एक चित्र को देखना और उसके नीचे दिये गये विवरण को पढ़ना शुरु किया पर फिर लगा कि इतने शहीदों का वर्णन पढ़ते-पढ़ते मैं भी जल्दी ही शहीदों की लिस्ट में अपना नाम लिखवा लूंगा। हे भगवान ! इतने शहीद यहां और इनके अलावा उन्नीस सौ के करीब जलियांवाला बाग में! अब मुझे इस बात का कोई आश्चर्य नहीं हो रहा था कि अमृतसर में हर सड़क का नाम किसी न किसी शहीद के नाम पर ही क्यों है? शहीदों के चित्र देखते देखते अंतिम कक्ष में पहुंचा तो देखा कि नवीनतम शहीदों की पंक्ति में बेअंत सिंह और सतवंत सिंह के भी बड़े – बड़े तैल चित्र लगे हुए हैं। पहचाने आप? बेअंत सिंह और सतवंत सिंह वे दोनों अंगरक्षक थे जिन्होंने अंगरक्षक के रूप में प्रधानमंत्री की सुरक्षा की जिम्मेदारी अपने सिर पर लेकर भी निहत्थी प्रधानमंत्री इंदिरा गांधी की हत्या की थी। मन में सहसा विद्रोह की भावना ने सर उठाया। फिर देखा कि एक तैल चित्र और लगा हुआ है जिसमें गोलों – बारूद की मार से क्षत-विक्षत लगभग खंडहर अवस्था में अकाल तख्त का चित्र था। अकाल तख्त की यह दर्दनाक स्थिति आपरेशन ब्लू स्टार के समय आतंकवादियों को अकाल तख्त से बाहर निकलने के लिये विवश करने के दौरान हुई थी। एक आम भारतीय की तरह मेरा भी मानना है कि अकाल तख्त की ऐसी कष्टकर, वेदनाजनक स्थिति के लिये यदि भारतीय सेना को दोषी माना जाता है तो वे लोग भी कम से कम उतने ही दोषी अवश्य हैं जिन्होंने भिंडरवाले को अकाल तख्त में छिप कर बैठने और वहां से भारतीय सेना पर वार करने की अनुमति प्रदान की थी। अकाल तख्त की पवित्रता तो उसी क्षण भंग हो गई थी जब उसमें हथियार, गोले और बारूद लेकर भिंडरवाले और उसके अन्य साथियों ने प्रवेश किया और इस बेपनाह खूबसूरत और पवित्र भवन को शिखंडी की तरह इस्तेमाल किया। वैसे जो लोग राजनीति की गहराइयों से परिचित हैं उनका कहना है कि भिंडरवाले भी तो कांग्रेस का ही तैयार किया हुआ भस्मासुर था जिसे कांग्रेस ने अकाली दल की काट करने के लिये संत के रूप में सजाया था। अस्तु !